A while ago, a friend’s child was bullied at school – nothing new, just comments about her appearance. It brought me back to a long time ago – a former life, it seems, when I was bullied by some girls – pretty ruthlessly. I won’t go into all the details, but I will hone in on one particular day. I was 9, and the main “ringleaders” actually had a slumber party with the express purpose of torturing me (I didn’t know this, of course, until I went, but it did not take me long to find out. I think it was the second time I was left out of the “meeting of the bullying minds” with one of the other girls, that was not particularly pleased with the line of entertainment for the evening, when she let me in on the plan and fessed up to what they were plotting behind closed doors). What happened next, I will always remember and, actually, be grateful for. I called home to talk to my Mom and she gave me two choices – 1. She could come get me, rescue me, take me away from it. Or, 2. I could stay until morning. As a Mom, I am pretty sure I would launch into plan 1 pretty quickly, no questions asked. But, for some reason, my Mom had the wisdom to listen, but let me decide how much I actually needed her to rescue me. I am not sure why, or what possessed me, maybe it was just the confidence that my Mother thought I COULD stick it out – but, I decided to stay. I decided to ignore the haters, be as kind as I had been all along (in other words, not treat them as they had been treating me), and see what happened. What did I have to lose anyway? By morning, most of the girls had come to realize something about me – they wanted my friendship, and were willing to sacrifice the friendship of the cruel “ringleaders” to get it. I didn’t let them change me or bring me down, and I did prevail. And, I proved to myself that my strength of character was greater than I had expected. Thanks, Mom. Later in life, the “ringleaders” were on the opposite end of where I wanted to be (and was) in high school and beyond – their beauty had already deteriorated by poor choices (drugs, alcohol, etc). Their grades were poor, and I was so grateful that I was no longer in their circle of friends. I had surrounded myself with people like me, and people who helped improve me, not people who brought me down. We have been so blessed that we live in a small community where, so far, my kids have not been bullied or teased or made fun of even once for wearing a brace or, in my daughter’s case, for having a hump on her back when out-of-brace. People where we live have seen enough hardship to know that we all have problems. We still have bullying, don’t get me wrong, but, so far, it has not been directed at MY kids. But, I have told them multiple times that they can absolutely expect for someone, at some point, to be cruel. It is the world we live in. It’s all about how we handle the cruelty that matters. We talk about bullying pro-actively, so they have a plan, a mindset, or place of comfort they can seek when it does occur. And, it will occur. I think it happens to everyone. Growing up, I was a complete nerd. I am now proud of that fact – we are a family of nerds! In our house, nerd is a compliment. It means smart, witty (funny in a clever way, not a crude one), inventive, creative, original. Was I teased or excluded from certain things because of it? Absolutely. Would I have changed it? Not a bit. And, more importantly, would my character be what it is today without it? No. My kids are very sensitive to kids that are hurting in their classes and other activities. Why? Because they have been different and hurting themselves. They are the first to talk to the girl nobody will talk to, or sit at lunch with the boy everyone teases. They may not like certain kids, but they would never be mean to them. I think that their Scoliosis challenges are a big part of what created this in their character – and, having a nerdy, formerly bullied Mom who won’t stand for it! 🙂 I am constantly telling them to try and always choose kindness. If you are being bullied, for any reason, just know that you are never, ever alone. More people are in your shoes than the bully’s shoes. Seek out a parent, teacher, good friend, or Pastor to discuss your feelings. You can also always talk to God. (Or, if you feel truly alone, email me.) Make the choice to not let the bully take away what is great inside you – your individuality, your strength of character, your light. Ignore the negativity as best as you can and make the decision that you will prevail, because you absolutely have that power 100% inside of you. Bullying is just smoke – it will dissipate. But, you will build courage as a result, a raging fire, that will never go away. When my daughter and I unwrapped our shiny new copy of Debra Ordes’s new book “The Gift of Scoliosis”, we both shared the same questioning look. How, pray tell, is this disease a gift? We are definitely the champs of turning lemons into lemonade, but this book title prompted a thorough investigation. 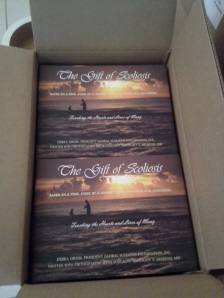 Debra Ordes, president of the Global Scoliosis Foundation, Inc, contacted me several weeks ago and asked me if I’d like to read her new book, “The Gift of Scoliosis”. I was, of course, very interested and was excited to get my copy. The book, which details her struggles and triumphs (and adventure!) with Scoliosis, is a beautiful story of hope and determination, and ultimate victory. Debra’s co-author is spine surgeon Anthony P. Moreno, MD, who also writes of his journey to becoming a spine surgeon, as well as of his work with Debra to reach out to patients with other extreme (and life-threatening!) cases of Scoliosis in order to come to their aide through global outreach and tireless determination. The book is full of beautiful illustrations, inspirational passages, and heartwarming stories. I hope you enjoy reading it as much as we did. You can learn more at: www.thegiftofscoliosis.com. As my daughter has been adjusting to the chaos that is middle school, she’s had a couple days where she’s felt downright overwhelmed. Between more homework (and lugging a VERY heavy book bag to school, which is fodder for probably some further articles on back health and back packs, but I digress…) Anyway, between more homework, volleyball every day after school, and games twice a week, she also has her therapy for Dr. Morningstar (ARC 3D program) and her physical therapy that she got from the therapists at University of Michigan hospital. The exercises can take up to 45 minutes per day and she has been SO diligent up to this point, doing them every day without complaint. A couple of days, however, I’ve just had to assure her that it is ok to let the exercises go, but she really doesn’t WANT to let them go. Sometimes there is just not time, and I don’t like her to sacrifice her sleep. Even though she knows she will have surgery in March, she realizes that it is important to stay diligent – that all the experts she has spoken with agree that if she is stronger going INTO surgery, she will recover faster afterward. And, as Dr. Morningstar pointed out this week, any little bit that we can get her de-rotated, will be that little bit less that has to be fixed surgically. So, it is still important that we stay the course and work hard, even when facing the inevitability of surgery. In the past year, my husband and I have noticed that her posture has been deteriorating – her shoulders would slump up and forward (even in-brace) and, when her brace is off, her rib hump is highly apparent. Since she has been doing Dr. Morningstar’s therapy and the Physical therapy from University of Michigan, we have noticed visible improvements – her shoulders are relaxing down and resting lower and pulled back. She can also go longer out-of-brace without complaining of back fatigue or soreness. These are little changes, but they are very important. Not only will they make her stronger and more ready for surgery, but they give her some encouragement that all the hard work IS paying off. We all see now that accepting surgery is not accepting defeat – she will still have to work hard her whole life to keep her back healthy (even after surgery), but that the hard work IS WORTH IT. I want to encourage anyone reading this that Scoliosis should never be a complacent disease – never accept the “do nothing” attitude. No matter how small a curve (like my son’s) or how large (like my daughter), there is so much you can do to see improvement, and every little bit helps. It takes a long time to see the results, so you must be diligent, but doing SOMETHING will always get you farther than doing nothing. I will (hopefully) be back Friday to write about a wonderful new Scoliosis book that I’ve read recently. Until then, wishing you all many blessings and wonderful spinal health. We are off to the start of yet another school year. And, I am hoping that means that now I am back in the routine of my weekly posts. 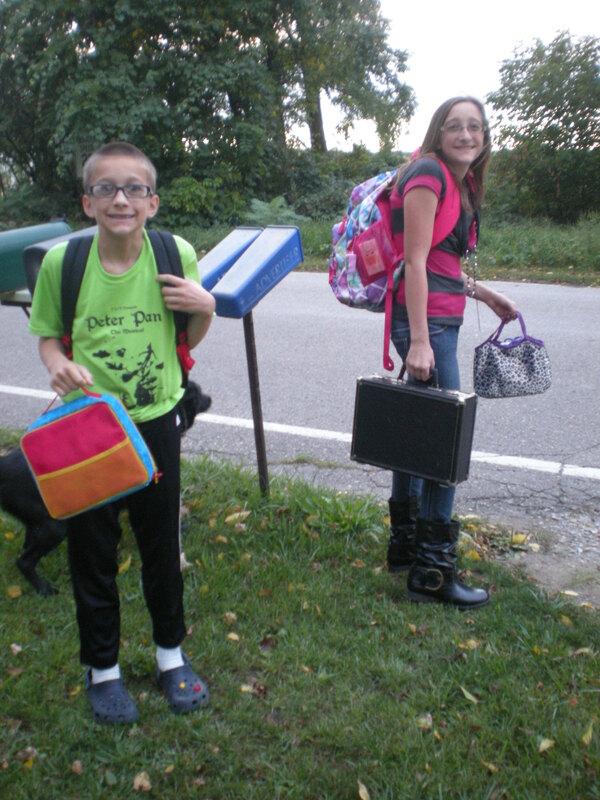 This week was our first week with our daughter in the Middle School and our son in the 4th grade. Middle school can be very tiring, and my daughter is handling it like a champ. On top of her regular classes (most of them she is with 8th graders, even though she is in 7th grade), and volleyball practice every day after school, she has her 30 minutes to an hour of physical therapy every night. She never complains, she just gets stressed out. Wouldn’t we all? I remember how the first couple weeks of school every year was incredibly tiring, but starting Middle School was an adventure that was never surpassed in the other years. Fortunately, we have a very small school and she is VERY familiar with it because her Dad is Principal! She handles THAT like a champ, too – he claims she has been expert at avoiding him, but she said she’s just busy trying to get where she needs to go. I am wishing every one of the kids out there a wonderful start to the school year. Stay tuned now for (hopefully) weekly posts concerning all things family and Scoliosis. Have a great week!